An animated film loosely based on the book series of the same name by Cressida Cowell, produced by DreamWorks Animation and distributed by Universal Pictures. 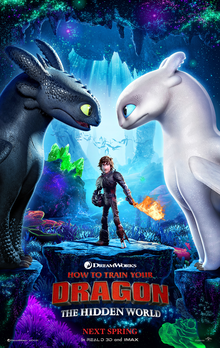 A sequel to 2010’s How to Train Your Dragon and 2014’s How to Train Your Dragon 2, it is the third and final installment in the How to Train Your Dragon film trilogy. Despite the technical brilliance in sound and animation (sometimes the score really stood out as brilliant orchestral writing, distracting from the action). I didn’t really get and emotional involvement from the story. It was all very well done, and wraps up the trilogy nicely. But not in an outstanding way.